The controversy at the University of the South Pacific over Dr Marc Edge was meant to dissipate when he was stood down as the Head of Journalism and the role was assumed by his immediate superior, the oleaginous Professor Sudesh Mishra. But Professor Mishra has made a mistake that is fatal for any academic of standing – misrepresenting the true course of events at USP as the University grappled with what to do with the unfortunate Dr Edge. Earlier today, Professor Mishra posted the following comment on our previous Grubsheet posting reporting Dr Edge’s demise. It is riddled with non sequiturs and outright porkies. And the proof of that is the exchange of correspondence seen here publicly for the first time between Professor Mishra and the USP’s Deputy Vice Chancellor, Professor Esther Williams. I am afraid there are several factual errors in this column. Pl can I have an update on Marc Edge and actions taken by the School and Faculty. We have had again complaints from students about his approaches and work; we also have had complaints from Fiji Government about his attacking comments on his website. The PS Information has submitted a formal complaint. I have read the website as well as the students’ website on the same subject. We cannot allow it to continue as it is placing our whole reputation and our journalism programme at stake. This behaviour and exchange is doing serious damage to the USP. You will need to specify which comments have upset the regime, and why. As far as I can see, Marc has been under assault from all quarters for several months for having a dissenting view to which he is, surely, entitled. Graham Davis, for instance, has written several uncomplimentary articles on Marc. Is USP planning to ask Mr Davis to desist? What’s good for the goose is good for the gander. Marc may not realize the complexity of our politics, but he is slowly coming to terms with it. Moreover, I may not agree with his views (and I disagree with him on many fronts), but he certainly has the right to express his opinion: this is called academic freedom. Student complaints we take very seriously. In this respect, I have been talking to him about improving his style, attitude and approach to suit our cultural context. I shall keep mentoring him on this front. Incidentally, I cannot deal with complaints unless I see them in writing. If you could forward me the regime’s complaint, I shall take up the matter with Dr Edge and the Dean. The regime has yet to respond to a complaint lodged by Dr Edge. The goose-gander principle applies here as well. A couple of observations can be drawn from the previous exchange. When the Deputy Vice Chancellor of the University of the South Pacific wants something done to protect the USP’s standing, her subordinates hardly jump to attention. And Professor Mishra is demonstrably protecting Dr Edge, despite his protestations to the contrary. It has been the claim of many internal observers to this unfortunate saga and here’s the proof. One thing is certain. This saga has a long way to go. And in the meantime, the reputation of the USP and its School of Journalism is being trashed. Don’t take our word for it. The Deputy Vice Chancellor says so herself. Fiji Media Watcher – you know the rules. Your last line is personal abuse. It’s my blog and I’ll run it the way I please. You are terminated. You really are a petty, vindictive little man. Marc Edge had the temerity to argue that the PINA conference was not as unified as you had written. He disagreed with the great Graham Davis. The ignorant chap was obviously unaware you had won a Walkley and a Logie. He was unaware that in the Spirit of Pacific journalism you can never contradict your ‘betters’. So ever since you have spent countless hours and column inches on a personal vendetta. It is very symbolic of the regime that pays you so handsomely. Anyone who has the temerity to oppose them is viciously attacked until they end up in hospital, prison or on the next plane out of Fiji. Keep up the good work. I am sure your truly Christian father is watching his son’s actions with great pride. “So Sad”, what’s sad about it? None of this has got anything to do with what happened at PINA and you know it. You choose to ignore the adverse impact of Dr Edge’s behaviour on some of his own students, his gratuitous attacks on fellow academics and the wider issue of the impact he is having on the proper training of the region’s journalists. Some important links between USP Journalism and other academic institutions and media outlets have been destroyed or damaged because of Dr Edge’s behaviour. All these are matters of legitimate public interest. As to the notion of a personal vendetta, I suggest that you read Dr Edge’s own blog, in which he more than gives as he gets. He has made the most outrageous comments about me and others, such as Crosbie Walsh, who haven’t attacked him at all. If he has a glass jaw, diddums. I certainly have a clear conscience about setting the record straight when I have evidence of what has really happened behind the scenes at USP as opposed to the version being peddled by Professor Mishra. Do you really think that Dr Edge was removed because of me? Rest assured, I’m just one attack dog in a pack of hounds chasing this fox. The difference is that I’m the only one who is barking in public. But when it comes to the truth, he seems not to know it. What is the real relationship between Marc and Sudesh? Because the way things are going, they’re both on the edge. So why is everyone out to tea? Surely it’s time to bring it to a close? No I don’t know that. When you first attacked Marc Edge he had been teaching at USP for over 6 months and there was not a murmur about him. You then go on the attack because in your words “I was genuinely gob-smacked to read Dr Edge pour scorn on my own account”. Then suddenly Marc Edge becomes a figure of hate on your blog site. Basically you are out to get him because he challenged Graham Davis. The Walkley and Logie winner and never shall that be forgotten. That was too much for you and so he had to go. Using your new found power and influence in the Dictator’s inner circle you are doing your best to get him deported. You have even got Sharon Smith Johns to write numerous letters of complaint to USP. If you don’t think that is sad then I feel sorry for you. What would your former colleagues at the BBC World Service make of your behavior. I think they would bow their heads in sadness and shame. Marc Edge is his own worst enemy with his condescending attitude towards students, and his overall poor performance in running the journalism school. A big, fat complaints file against him sitting at USP is testimony to this. After the PINA conference became a forgotten incident, Marc Edge continued on his path towards self-destruction. He came from Canada with a big attitude problem. Apart from mistreating some students, he looked down on things Fiji and made it that he was a superior being from a superior country. He seemed to expect everyone to bow to him due to his self-imagined superior intellect. Apart from Sudesh Mishra, who seems easily dazzled by white expats from Canada or Australia, no one bowed to Marc Edge, not even students. Marc Edge made much of his wit. From my conversations with students and others at the USP Campus in Suva in recent days, I gather that in his immaturity, Marc failed to differentiate between wit and sarcasm. He failed to grasp that witticism can wear thin after a while and get boring, and that sarcasm can be taken too far; that it can bite and deeply offend. 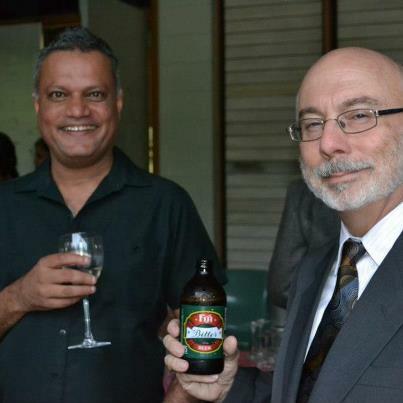 In contrast, two other expats at USP got on famously with students. Their names escape me but students say they did not fight with them, make sarcastic comments or run them down. These two expats, I gather, produced excellent results and earned the gratitude and respect of all students. Marc seems to have divided the students between his favoured first years, and the second and third years whom he treated with a fair amount of disdain. By all accounts, Marc Edge appears to have been the architect of his own undoing. Graham Davis is a scapegoat. In fact, Graham Davis is to be thanked for highlighting students’ problems after Sudesh Mishra tried to cover them up. Hitler, Sadam, Osama were never alone in their time of terror. They had millions of supporters. Edge who is USP’s own dictator lacks the millions of supporters because he isn’t a very bright man. Instead he preys on the naive first years and of course Sudesh Mishra, the second in command in his regime of terror on poor USP students. One thing though is common in the fall of all dictators, they are destroyed from inside because not everyone allows their conscience to stand by and watch acts of evil so idly. All respects to whoever leaked this email and to all who have fought against these tyrants, let us hope justice prevails. As someone who has worked in the Fiji media industry for 23 years I see this as a sad state of affairs because institutions like USP and FNU have journalism programmes that are the breeding ground for future journalists. I’ve long held the belief that future journalists should be taught by our own people, not some outsider who comes with a preconceived idea of first world journalism and trying to ram down the throats of students. Names like Netani Rika, Dennis Rounds, Samisoni Pareti, Ioane Burese come to mind. That way they have an insight as well into standard practices in the local media industry. Wasn’t he the Fiji Times Editor who engaged in ‘skirt journalism’ to malign Mahen Chauhdry? Come on man, go read the thesis by Ranjit Singh about how the Fiji Times engaged in all sorts of sordid behaviour that was racially and politically biased. You must have had your head up some unmentionable part of your anatomy if you missed the Netani Rika & Russell Hunter conspiracy to undermine democracy in Fiji. Go read Ranjit Singh’s thesis. You hold up Rika as one of the paragons of Fiji’s media industry. Mate you are living in a fantasy world. The guy could not even get the 2011 Remembrance Day story about the Battle of At Tiri right! Even though he was given the full script, he fucked it up through his sheer incompetence. We ex-servicemen think he is a dickhead. He was/is a lazy nincompoop. I don’t know this Mr Burese but I always wonder why some people are always promoting Mr Rika and the Fiji Times. Mr Rika seems to be very good at making himself famous but getting other people into trouble. I wonder what that good man of God, the Reverend Akuila, thinks as he stands in the dock now accused of contempt thanks to Mr Rika.